The Evolution RAGE4 is a 185mm chop saw designed exclusively for Electricians and Plumbers. Producing fast, ultra clean cuts through armoured cable, Unistrut and cable tray, as well as conduit, chrome, copper & plastic pipe, plus plastic hose. Easier to use than a hacksaw, far more portable than a 14" (355mm) chop saw. No heat, no burrs; ready to weld - saving you time. Lowest cost-per-cut, compared to abrasive discs. Round, square & rectangle materials. With mitre detents & locking pin. For added safety & cleaner working environment. Easy to move & transport around the workplace. Accurate cutting - cuts mild steel with ready-to-weld, clean & square cold-cuts. Unlike abrasive cutting, the RAGE4 TCT blade cuts steel with no harmful dust, no burrs & virtually no sparks, leaving an instantly workable finish. Powerful 1250W hi-torque motor with optimised gearbox & blade system. Accurate & durable vice portability with 0˚ - 45˚ mitre detents. A robust, durable base - ideal when handling heavy-duty, metallic applications. Lightweight, easy to transport, taking up little space, weighing only 9.1kg. Versatile, repositional fence for cutting of round, square & rectangle materials. Chip guard & dust extraction port for added safety & cleaner working environment. Compatible with the Evolution 185mm Diamond blade for cutting stone, concrete and brick. (Sold separately). The arbor size of the RAGE4 is 20mm. No, a dust bag cannot be fitted to this machine. Yes, dust extraction can be fitted to this machine. 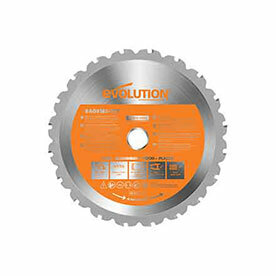 However, click here to see More FAQs about Evolution chop saws or, Contact our team of experts based in Sheffield, UK.